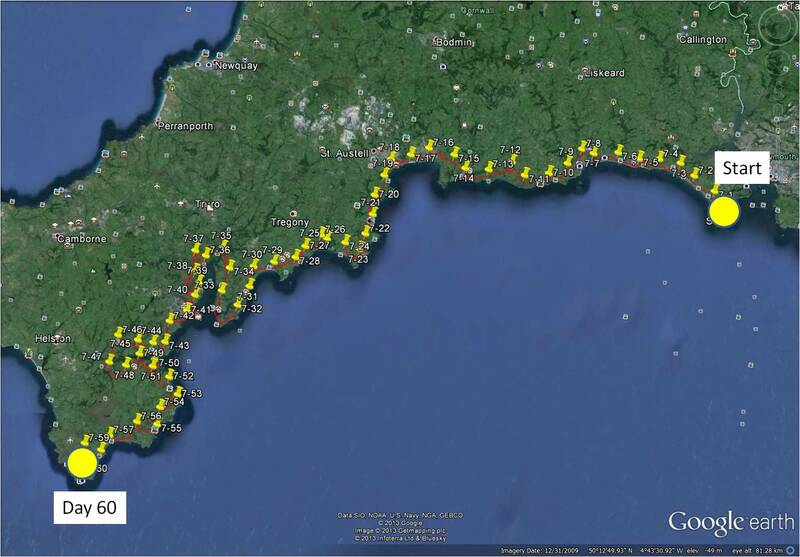 During the Christmas break, I completed my 60 day virtual bike trip along the south coast of Cornwall. The final two days of my trip took me beyond the heathlands of Goonhilly Down, toward the southern-most extent of England, near Lizard and Landewednack. This completes Phase 7 of my virtual biking adventure. My ‘trip’ began on January 30, 2013 as a way of encouraging me to do more exercise on my stationary bicycle. 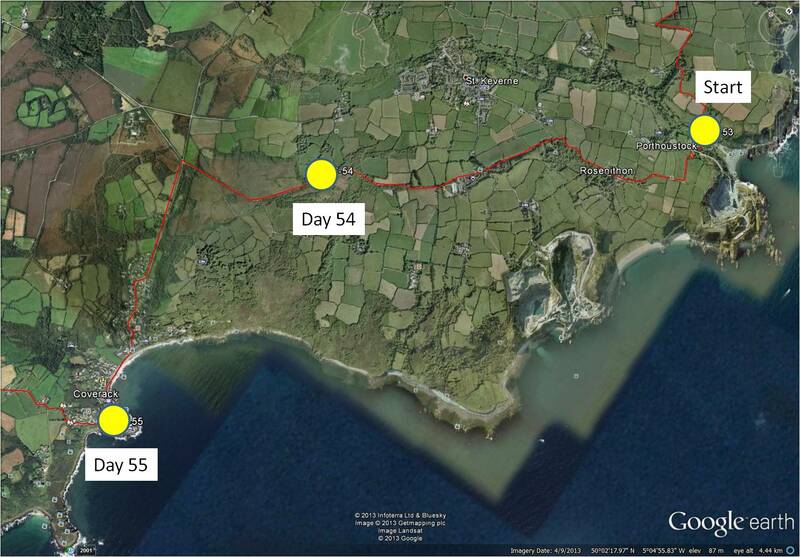 It has taken me (in Phase 1 to 5) from Lusignan, France to La Patache, France and (in Phase 7) from Rame, UK to Landwednack, UK. 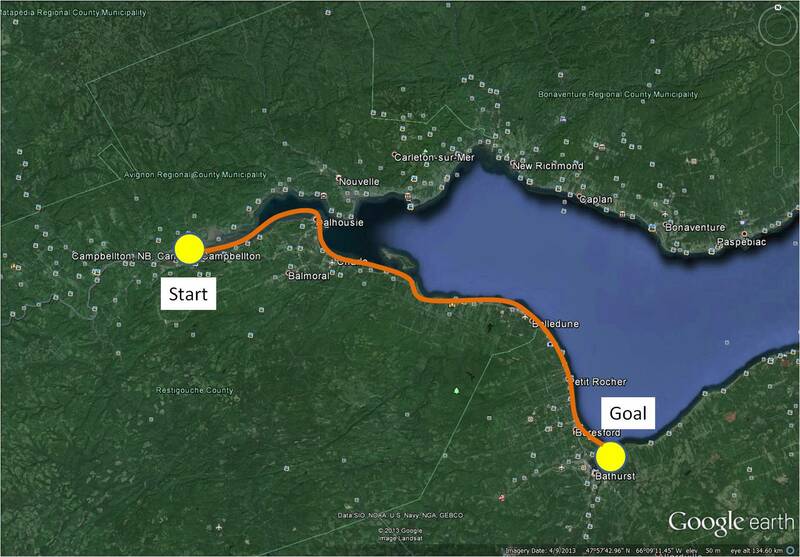 In Phase 7, I biked for 180 km and 1980 minutes. This represents an overall improvement in the length of each of my biking sessions (in Phase 1 to 6, I biked for 196.8 km and 1975 minutes). In total, I have biked for 376.8 km and 3955 minutes! I have improved my health, my mobility and my stamina, although I have not lost any weight. And I have been able to see and get to know the interesting and magical countryside of central France and the southern Cornwall coast! Of course, I am going to continue with my biking adventures. However, I want to change gears a bit and do some virtual biking closer to home. 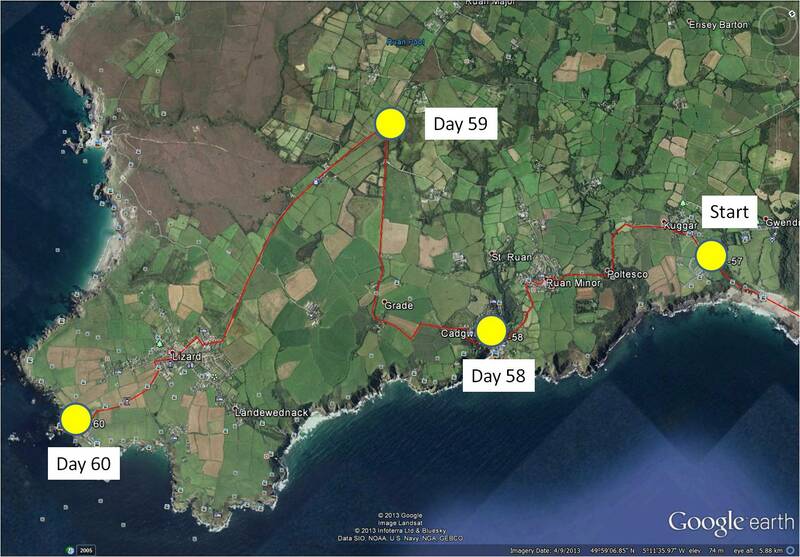 At my brother-in-law’s suggestion, I am going to do Phase 8 of my virtual cycling in New Brunswick, where I live. 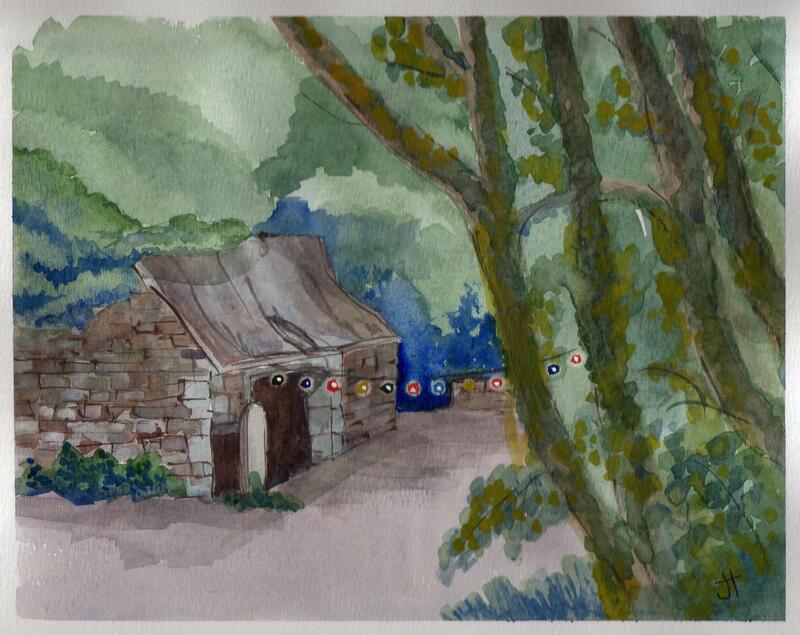 This will help me develop a portfolio of watercolours of more local scenes. Since I have actually travelled most of the roads I will see in Street View, I will be able to tell some stories of past adventures. It will also introduce my readers to the beautiful landscape of New Brunswick and a little of our regional history. In Phase 8 of my virtual travel, I will start in northern New Brunswick, in Campbellton, and follow along the coast of the Baie de Chaleur to the city of Bathurst for a distance of about 110 km. This is the area I explored in the 1980s as part of my work on air quality in the province. It is also an area where we have taken various drives and vacations. I hope you will continue to follow me on my virtual adventures! A couple of my houseplants have given me an early Christmas gift. 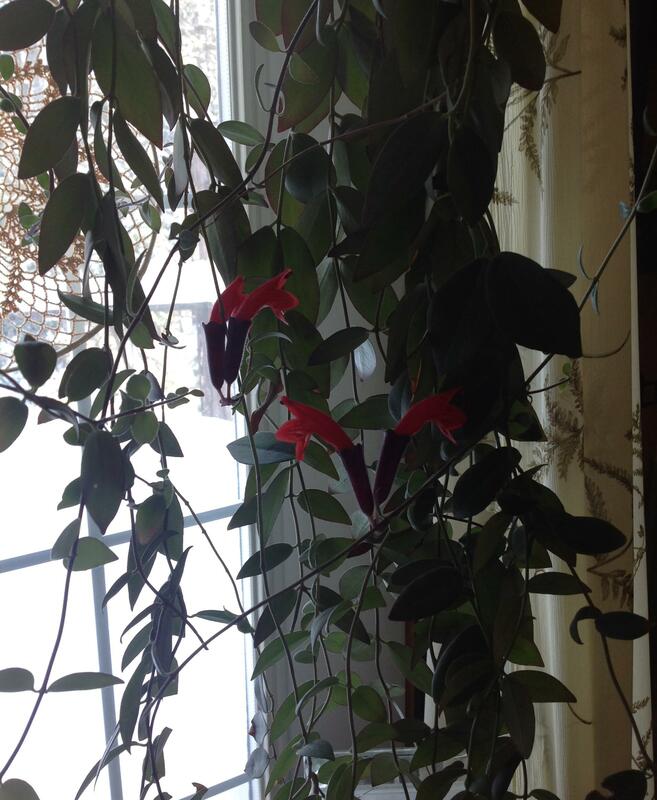 I had a hearty blooming of my Christmas Cactus early in December, and then, last week, my Lipstick Plant (Basketvine) (Aeschynanthus pulcher) burst into brilliant red blooms. Aeschynanthus is a subtropical genus from the same family as African Violets. This is the second time it has bloomed for me in the last two years. I am sure this plant is wishing me, and you, a Merry Christmas !!! 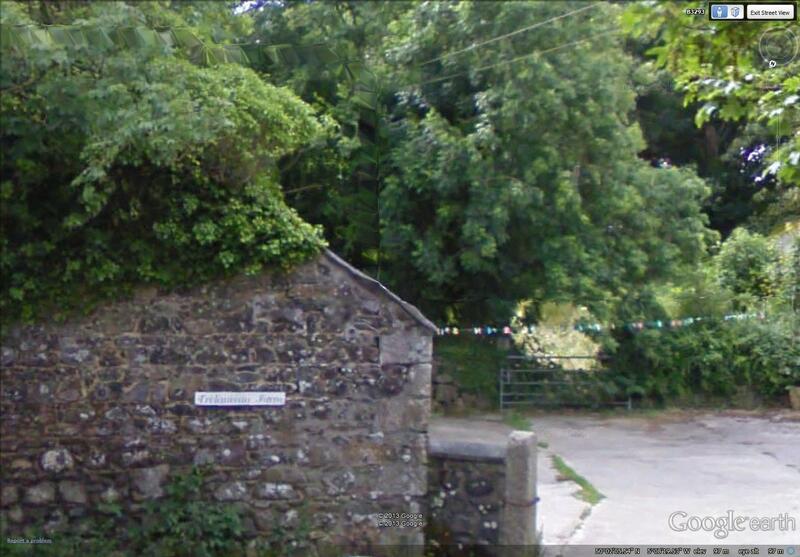 Something different has appeared in the maps of the area where I am ‘travelling’. Today’s virtual bike trip took me just south of a large ‘brown’ area of topography (seen in the aerial photo above). To find out about this area, I turned my stationary cycle for a side trip in the direction of Gwenter, just to the north of my planned path. 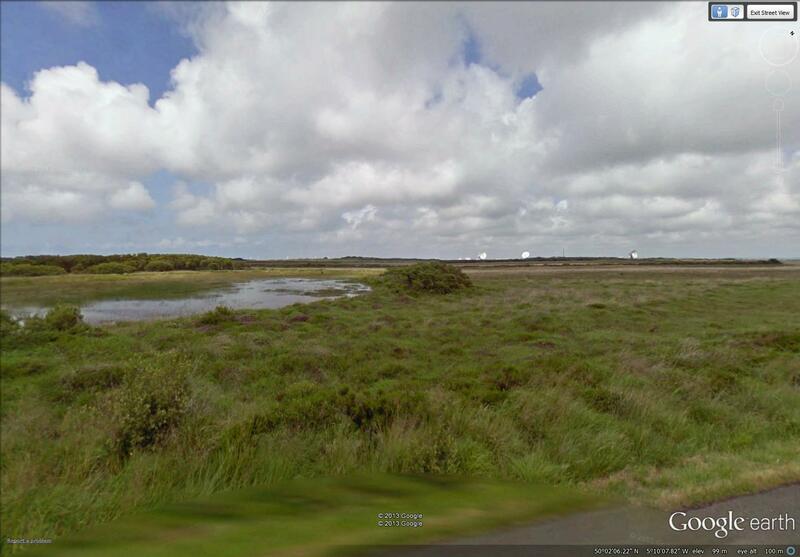 The area I found is anything but brown (Street View images were done in July). These are the Goonhilly Downs, a raised plateau of heathlands above serpentinite rock. Besides being a Site of Special Scientific Interest and the home of many rare plants, the heathlands are the location of a large windfarm (I could just see the turbines in the distance) and the Goonhilly Satellite Earth Station (the largest in the world). From the road I could see expanses of grass, tufts of fern, and ericaceous shrubs. Patches of purple reminded me of the Rhodora that blooms here in spring. From my reading about the Cornwall heathlands, I am certain this plant must be Cornish heath (Erica vagans), a species of heather common in Cornwall. I have a small patch of heather growing in my own garden, so this plant has a spot in my heart. I first learned about heathers in our history club in high school – we took a field trip to see the heathers growing abundantly in Point Pleasant Park in Halifax. They grow there in a 3300 square meter patch, called the ‘Heather Patch’, south of the Cambridge Battery. The heathers are not native but grow there as an escape – from the stuffing in the bedrolls of British soldiers in the 1700s! 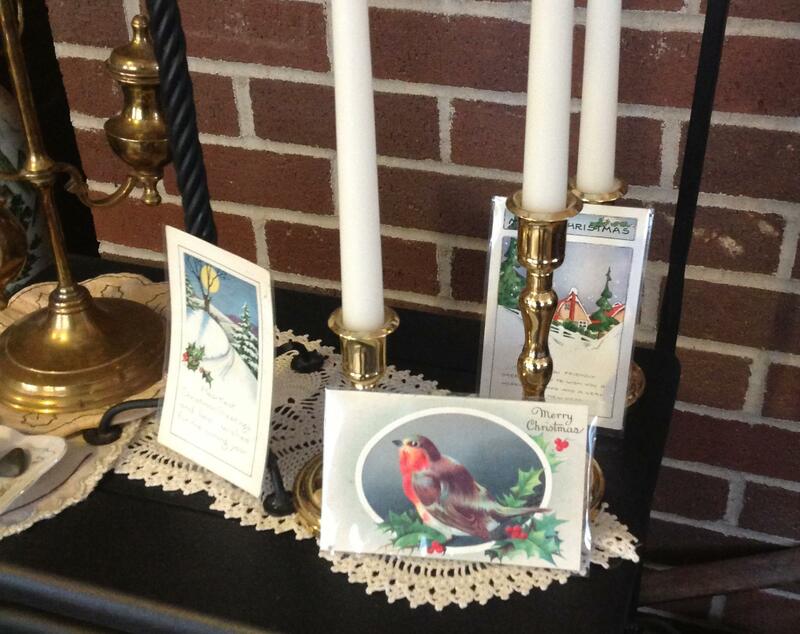 For a few years, I have hung examples from my collection of postcards on a string above the fireplace. I have postcards for all the major holidays – New Years, Valentine’s Day, St. Patrick’s Day, Thanksgiving, Halloween and, of course, Christmas. 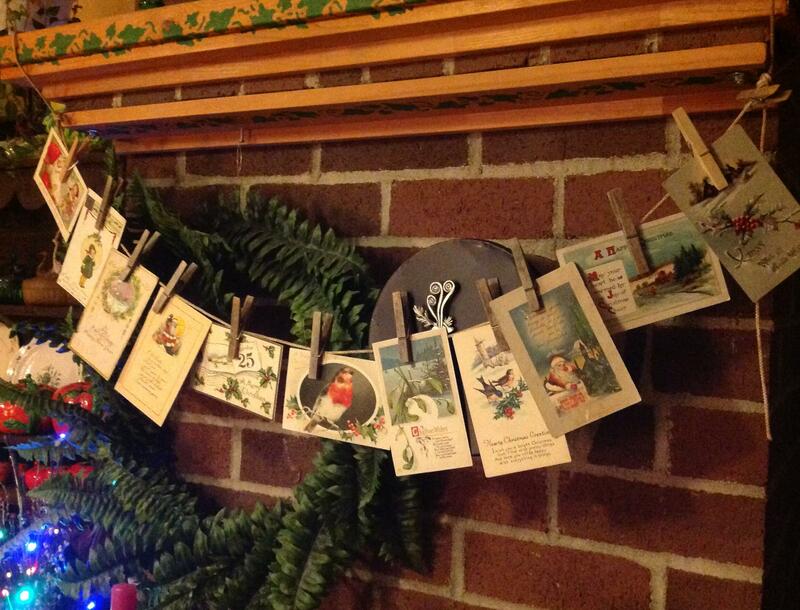 This year, when I hung my Christmas postcards, I could only find six. I need more, I decided, and went on eBay to find just three more. By the time I finished my bidding and winning, I had 14 postcards to add to my collection. After I had hung some of the postcards over my fireplace, I discovered 7 other postcards from a collection that belonged to my grandmother. 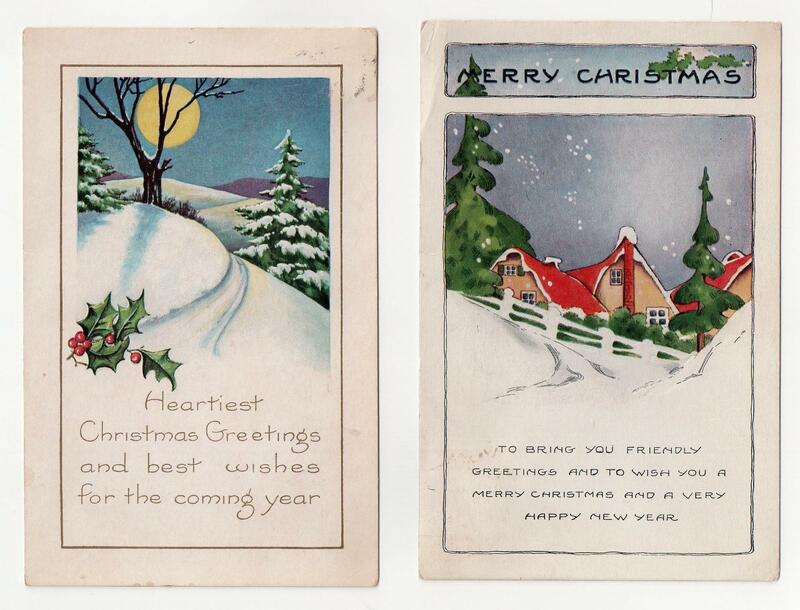 So now I have 27 vintage Christmas postcards. The eBay extravaganza was not necessary at all, but, oh, it was fun! three of my new postcards – notice, I now have two of a set of ‘robin’ postcards – will I go out to find three more I know are in the set???? In our house, we usually do a countdown to Christmas. 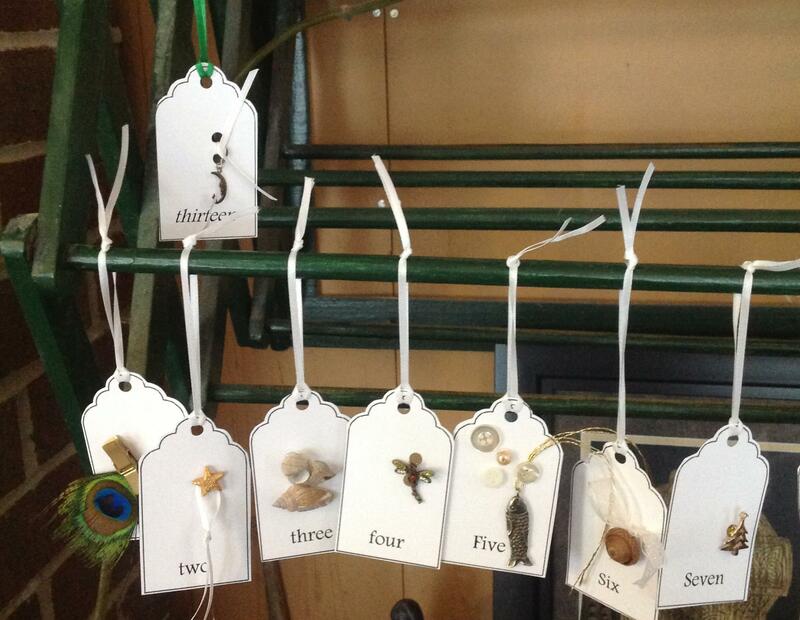 Ours is a countdown through Advent, beginning on the first Sunday in Advent and marking off the days, one at a time. Most years, I have a Jesse tree, a tradition in some Christian homes. This celebrates the long genealogy of Jesus who was of the house of Jesse, the father of David. When my son was little, we had bread-dough ornaments each illustrating Biblical events. When he grew older, and as the ornaments started to show their age, I put red and green ribbons on our Jesse tree. The Jesse tree itself is a two to three foot tall branch from a birch tree. A memory I have through the years is of ironing those ribbons to remove the wrinkles of the year gone by. 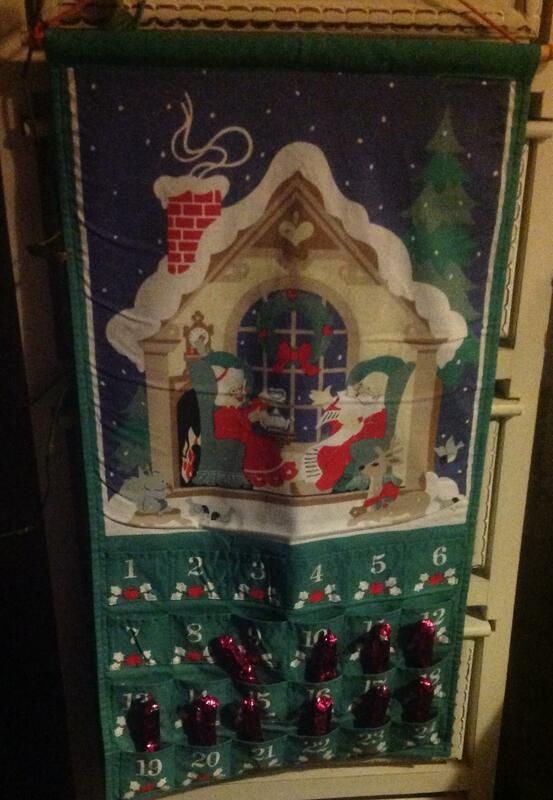 We also have a fabric Advent calendar with pockets for small treats. Most years we put mint sticks in each pocket. This year we couldn’t find our usual mint sticks, so we wrapped sticks of chocolate, one for each day in the calendar. This year, I decided to create something new to use for our countdown. 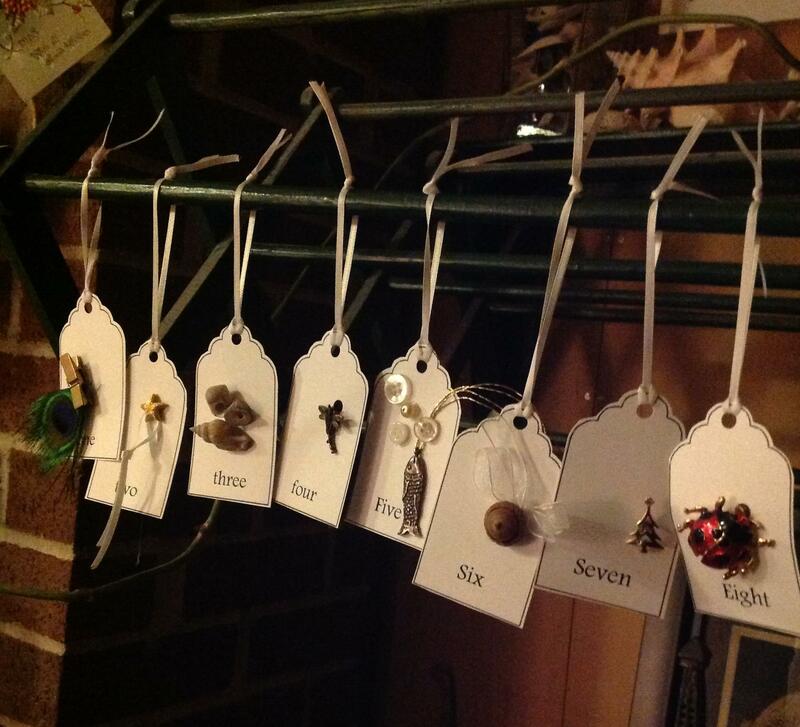 On Pinterest, I have seen several examples of countdown ornaments created from tags embellished with various trinkets. So I made twenty-five of these, since this year Advent and December both began on December 1st. 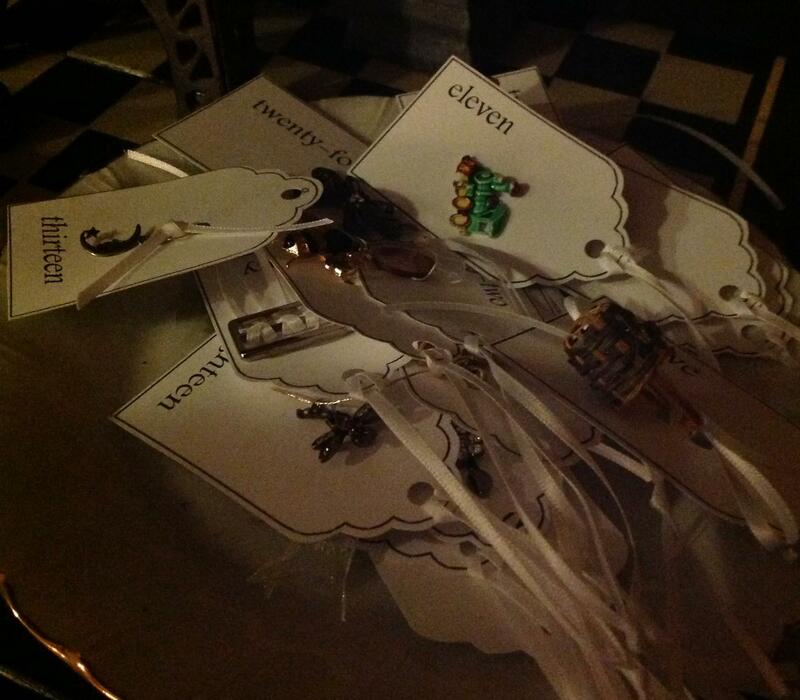 I printed tags with the numbers spelled out and fixed a small memento to each one. Most of these are trinkets I have kept in odd drawers over the years – mismatched earrings, buttons, acorns, feathers, shells, Christmas pins and so on. I threaded a ribbon through a hole punched in the tag. Each day since December 1, I have hung a new ornament, tying them to the bar of a drying rack we have in the living room. The ornaments are pretty and remind me of the days ahead and the days that have come and gone. Do you count down the days until Christmas???? 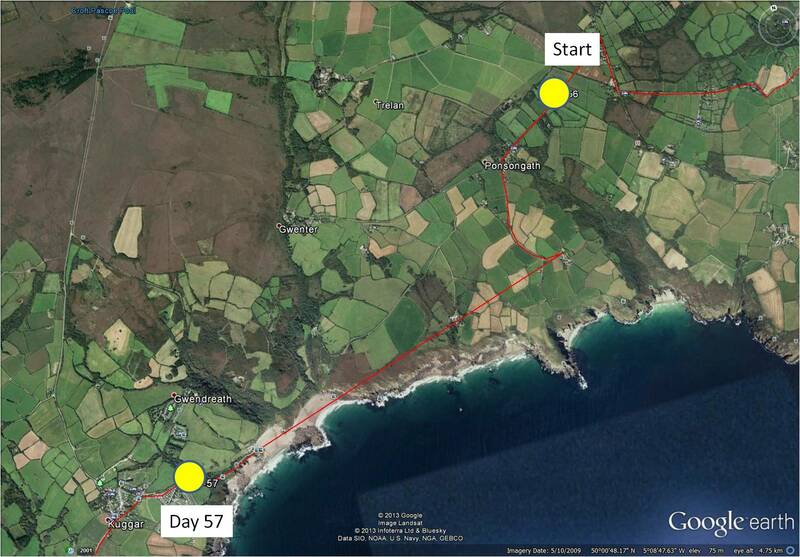 As I continue my virtual bike trip along the Cornwall Coast, I am heading towards Day 60 when I will reach Lizard and the southern-most point of England. 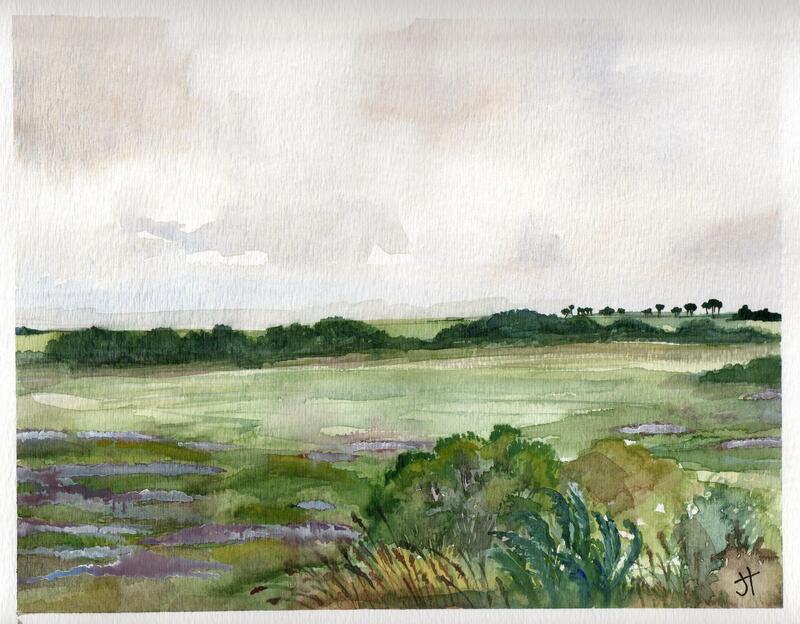 On the 56th day of my bike trip, I could not seem to find an image to paint. Then I took a side road northward and was inspired by a string of coloured lights across a walled courtyard. Perhaps they were not lights at all, but brightly coloured clothespins on a line. In any case, I saw my painting in my mind’s eye! It was only after I painted this and showed it to my husband, I realised I had painted a string of Christmas lights! 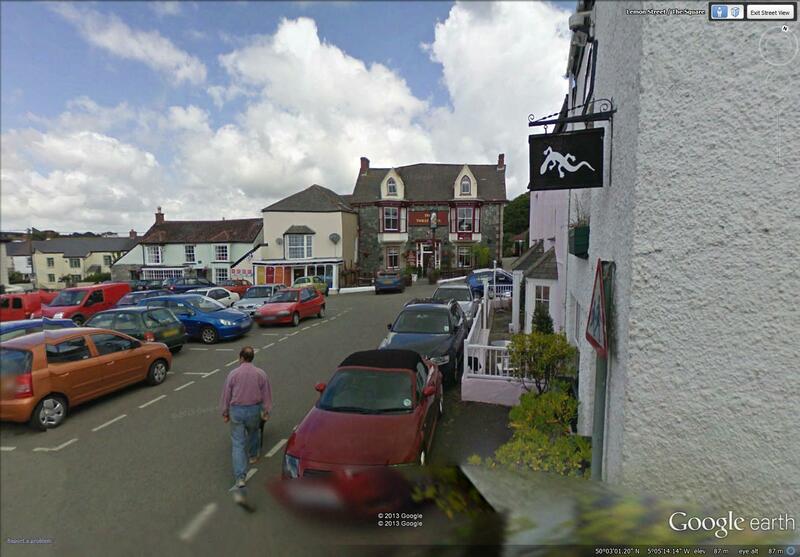 The lights in the Street View image could have been patio lanterns, but my paint brush was thinking Christmas!!! One of the light bulbs in my painting has burned out and has not been replaced. 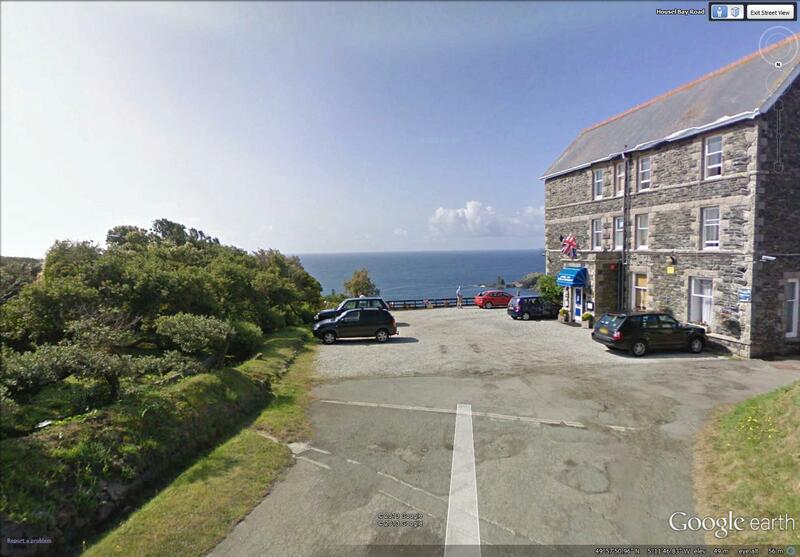 For a few days of my virtual travel along the Cornwall coast, I haven’t been seeing much of the coast. 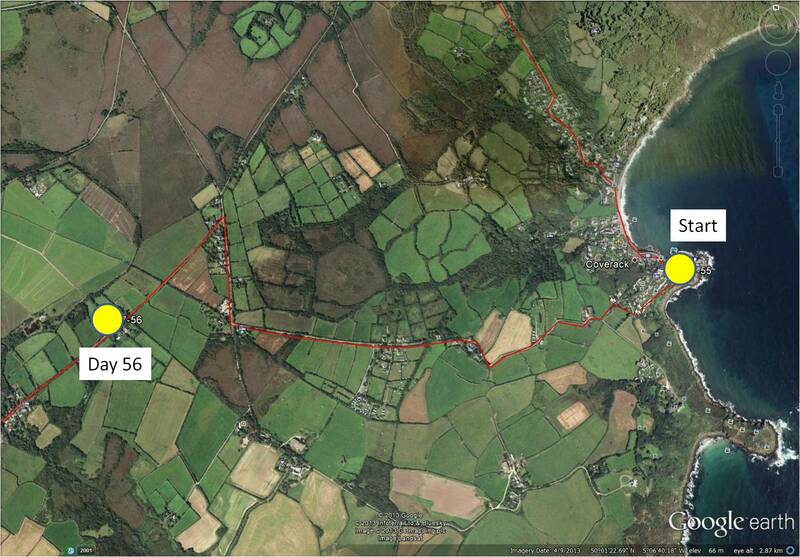 This is because my route took me inland, to skirt the tributaries of the Helford River. Now, though, I am travelling along the coast again. 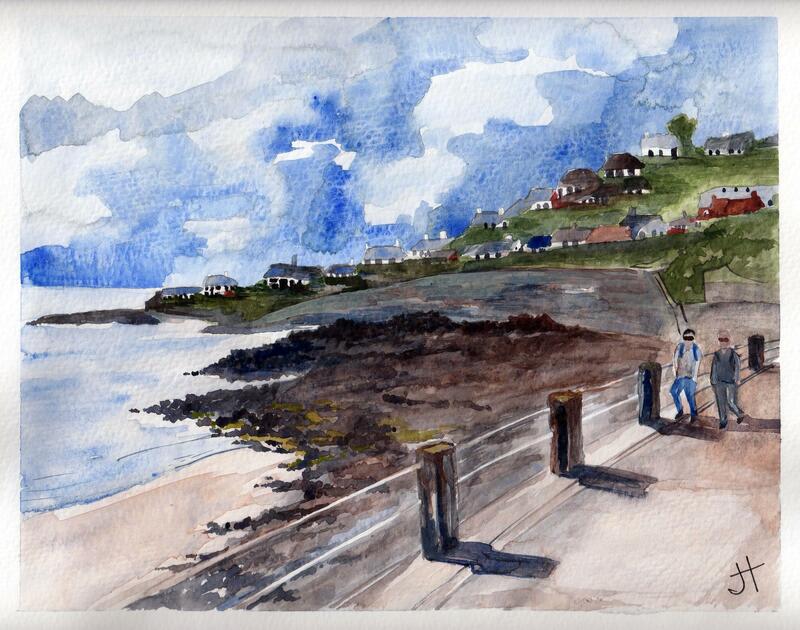 I haven’t attempted many people in my paintings, but in the watercolour below, I tried to capture a couple of the many people I saw enjoying the walk along the coastal road in Coverack. With artists’ licence, I paired two people who in real-life have likely never met one another !!! !